Size Choose an optionL = Chest = 42" between 44"M = Chest = 40" between 42"S = Chest = 38" between 40"XL = Chest = 44" between 46"XS = Chest = 36" between 38"XXL = Chest = 46" between 48"XXXL = Chest = 48" between 50"
The Steve Mcqueen Jacket is the first choice of the fashion lovers. If you also love opting latest style you should wear it. This outerwear is shown in a fictional movie named as “Le Mans”. It was released in 1971. The Steve Mcqueen Jacket is worn by great superstar Steve Mcqueen in the same movie. 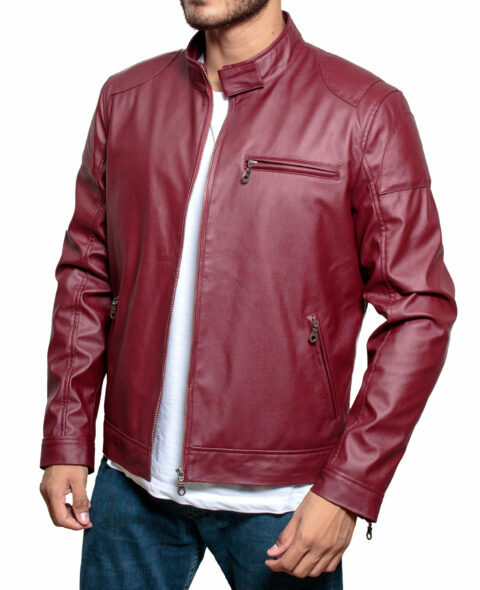 The external part of the jacket is prepared from the genuine leather or faux leather. There are three patches at the front side of the Steve Mcqueen Leather Jacket. The appealing black shade makes your persona winsome. The snap tab collar has formed a new style of the outerwear. You will also found front zipper closure in it for simple wearing. The Steve Mcqueen Leather Jacket has two side waist pockets and one zipper pocket on the chest. The red and white stripes are present on the left front side of the jacket. You will enjoy open hem cuffs of the Le Mans Jacket.